"Executive Order 9981, issued by President Harry Truman on July 26, 1948, desegregated all branches of the United States military by decree. EO 9981 is often portrayed as a heroic and unexpected move by Truman. But in reality, Truman's history-making order was the culmination of more than 150 years of legal, political, and moral struggle. Beginning with the Revolutionary War, African Americans had used military service to do their patriotic duty and to advance the cause of civil rights. The fight for a desegregated military was truly a long war-decades of protest and labor highlighted by bravery on the fields of France, in the skies over Germany, and in the face of deep-seated racism on the military bases at home. Today, the military is one of the most truly diverse institutions in America. 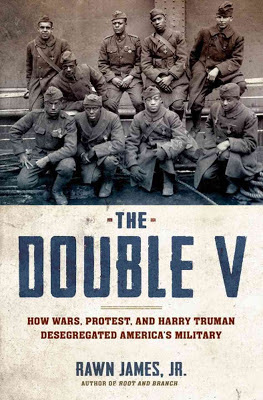 In The Double V, Rawn James, Jr.the son and grandson of African American veterans expertly narrates the remarkable history of how the struggle for equality in the military helped give rise to their fight for equality in civilian society. Taking the reader from Crispus Attucks to President Barack Obama, The Double V illuminates the African American military tradition as a metaphor for their unique and dynamic role in American history."